I had the privilege of spending the better part of a week with the guiding team at Singita Sabi Sands. It is rare in the industry to find a collection of senior guides with many years of experience who arrive on time and participate in training – believe me! Although we covered a wide variety of topics and the discussions went in many different directions, there is no doubt that the highlight for me was on a perfect late summer’s morning. 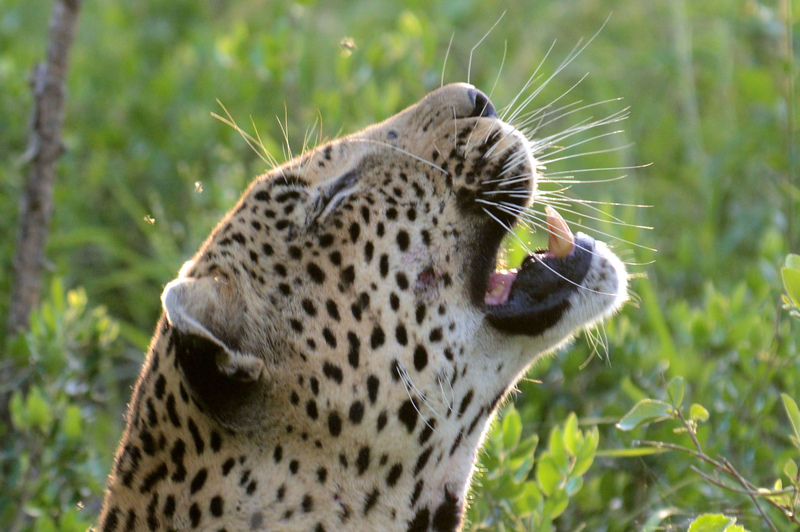 A good group of us gathered at the airstrip – while we talked, we heard the bush as it is supposed to be – hyena calling, birds chirping, grunts from a buffalo herd, impala alarm-calling, lion roaring in the distance and a leopard coughing! We could’ve just gone home it was so good, but decided to enjoy our planned walk. The next half and hour or so on foot delivered old leopard tracks, very fresh buffalo tracks, oxpeckers, fresh kudu tracks and the kudus themselves – these were just some of the tools at our disposal for building up a potential leopard sighting. We also had the knowledge that we had seen a 13-month male cub in the same area the previous evening on game drive. As we emerged from the woodland to a more open area, we glimpsed some movement. A quick raise of the binoculars and there was not just the cub but the mother too – TWO leopards moving, playing and sitting in the morning sun! They noticed us soon enough and the cub even came down the track a bit for a closer look. It was that perfect distance that you infrequently get with big cats, not too close that they panic, but close enough to view – us and them comfortable – what a treat. We reckoned we watched them for about 20 minutes before they melted away into the long grass and we were left with some rather large smiles! Learning? Well, upon reflection, these opportunities are few and far between and we had to ask ourselves if we had done enough in the build-up to really clinch this sighting. Sure the sighting in itself is enough, but is enough enough? When we talked back over the walk and picked out all the track & sign mentioned, we realised that unless we had made clever and thoughtful use of them to build tension and add weight to the story, we would not get the real climax! It takes mental application and effort to do this. For a family of 8 from overseas, this could literally have been a million rand sighting – done & dusted!